A college campus isn’t full of strangers that you walk by every day; it’s full of friends that you just haven’t met yet. That’s the philosophy behind Walla, a new startup app that took home first prize—and $50,000 to continue development—in the culmination of this year’s edition of the Duke Startup Challenge. Little more than a year ago, Walla was just a thought forming in Zhu’s mind. Her original idea was for a “generosity app” where students would put out a call for something they needed—a phone charger at the library or an Advil while on the opposite side of campus from their dorm—and folks in the vicinity would be able to lend a helping hand. What Zhu discovered, however, was that what students really needed was more people that they could turn to. They needed a new route to physically meet more people they could relate to and with whom they shared common interests. As Zhu puts it, they needed a better way to find their squad. That’s where Walla hopped on the stage. Users post open invitations for anyone nearby to come and join activities on campus, whether it be lectures, lunches, pickup basketball games, discussion groups or political watch parties. When students find they have some time to spare and a need for socializing, they can turn to Walla to see what’s going on in the next 24 hours that catches their imagination. Zhu obviously did not get from a barely formed idea to a competition-winning app full of momentum on her own. She leveraged many entrepreneurial programs offered by Duke. The Innovation Co-Lab, a “creativity incubator” on campus, supplied expertise and a small grant to help set up Walla’s servers. A year-long entrepreneurial program called Melissa & Doug Entrepreneurs supplied a stipend that allowed Zhu and her team to work on the project over the summer. Pratt’s own incubator, DUhatch, gave technical support and advice when needed throughout the year. Zhu also had a great team of Duke students pushing the project further. 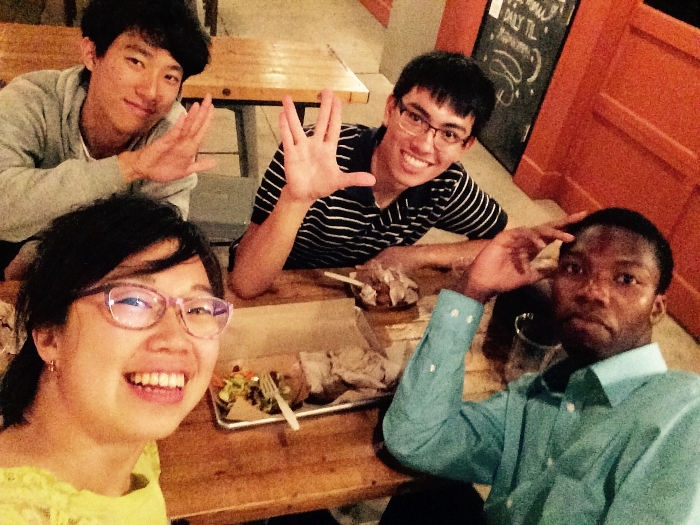 Walla’s team includes iOS/backend/web developer Joseph DeChicchis, a freshman in computer science; designer Vivian Li, a recent graduate in computer science; Android developer Anesu Mafuvadze, a freshman in computer science; and graphic designer Ben Yang, a sophomore in computer science and visual media. And according to Zhu, while the various financial grants and the grand prize from the Duke Startup Challenge are certainly helpful, the money pales in comparison to the value of having a great team. 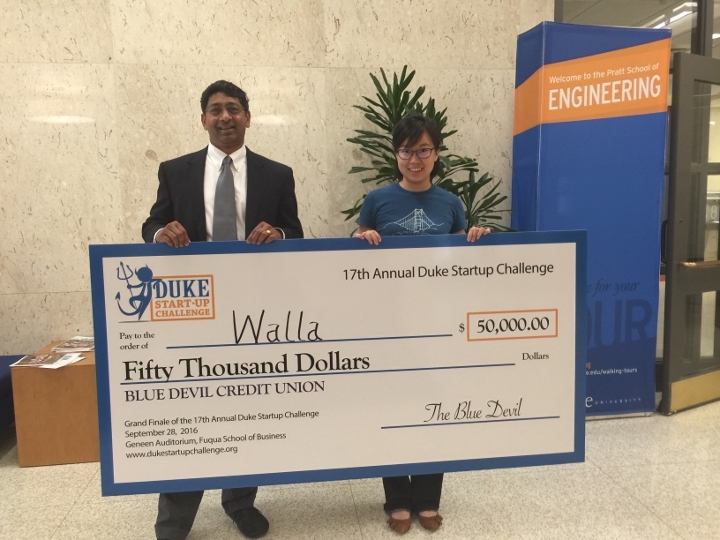 As with every team in the Duke Startup Challenge, Walla started as little more than an application to get past the first round. In the second round, Zhu and her team put together a business plan and started an Indiegogo campaign to raise funds. Walla attracted more than $5,000 through the crowdfunding campaign, enabling it to move on into the final round—a live pitch in front of a panel of judges. Walla was the last to present, and Zhu couldn’t believe the quality of the startups that she was sharing the stage with. “Before I start my pitch I just want to say wow, what an amazing stage to share with all of these great startups. I am truly astonished,” said Zhu at the beginning of her final pitch. For Zhu, the nerves weren’t much more than the usual of being on stage. To her, it was more exciting to be on a legitimate platform as an actual real startup selling an actual product and having people actually listen. It was validating. Walla got a lot more than validation after the dust settled on the competition—it won first prize and $50,000. Zhu says that money will be used to acquire and analyze more data and increase their rate of development. Her plan is to have Walla push out new iterations on a weekly basis as it tries to fit its users needs. Zhu’s plan is to continue to work on her startup after graduation, rolling it out to colleges across North Carolina within the next year. After that, she hopes to expand nationwide.